You are the current highest bidder! To be sure to win, log in for the live auction broadcast on 20 Apr 2018 14:00 BST or increase your max bid. 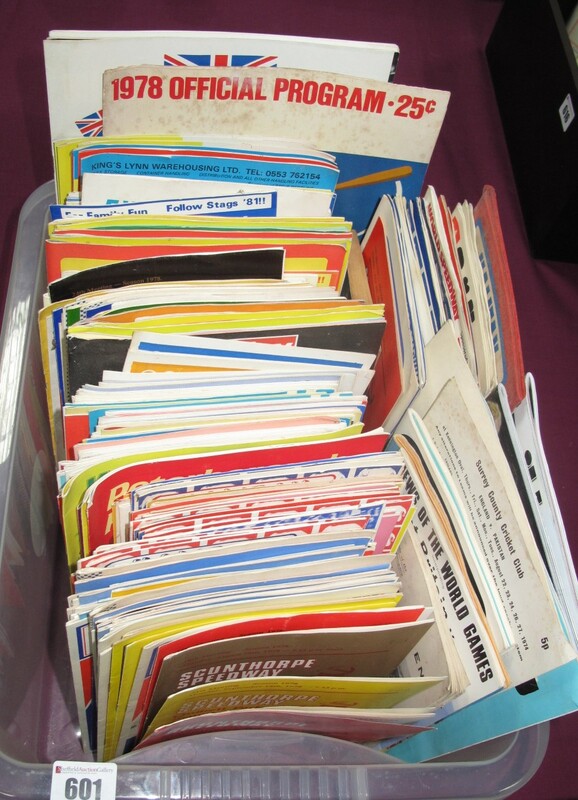 Speedway Programmes - Mildenhall 1975 First Match v. Scunthorpe, many other saints home and aways 1970's - 90's, etc. 1971 Silverstone and Nurburgring grand Prix, News of The World Games 1968, other sports programmes. Payments by card are not accepted from overseas buyers. UK buyers are limited to settling accounts by 'cardholder not present' up to £250. Saleroom.com buyers should settle by their card registered with the saleroom.com by following the link sent after the auction. Bank transfer is our prefered method. Sheffield Auction Gallery's preferred method of payment is by bank transfer for any amount. Payment on collection at the saleroom can be made by cash or card. We can accept payments by telephone only for amounts less than £250. We do not offer P&P on every lot (further info below). Payments. Accounts must be settled in full within 2 working days of the auction. Our accepted methods of payment are cash, debit cards, credit card, bank transfer or cheque. Debit & credit cards are only accepted by person in the saleroom using chip & pin. Payments by card are not accepted for overseas buyers. UK buyers are limited to £250. If settling an account by bank transfer all applicable bank charges or fees (at either the point of sending or receiving) must be met by the buyer. Cheques received must be fully cleared prior to collection of Lots(s) and this can take up to 10 working days after we receive the cheque. All Lots bought over the internet during Live Internet Bidding or via commission bids submitted to the Auctioneers through the internet facility (on applicable Auctions) are sold subject to a 3% plus VAT (3.6% inclusive of VAT) surcharge on top of the Buyers Premium. This is solely to cover charges incurred in offering bidders this facility. All purchases must be paid for in full before any Lot is removed from our premises. Lots which have been paid for may only be removed during the sale at the discretion of the Auctioneers. Any accounts/buyers remaining outstanding after 4 weeks of the auction will be automatically considered to have defaulted, the sale(s) cancelled, the Lot(s) reoffered in auction or returned to the Vendor(s) and the buyer banned from making future bids with the Auctioneers, the-saleroom.com and any other applicable bidding platforms, the Auctioneers reserve the right to inform other Auctioneers of the details surrounding the non-payment/default as appropriate.